Riding along a dusty ridge top trail whilst savoring a panorama of awesome Himalayan peaks, taking in the sights & sounds of everyday rural village life, exploring the reaches of a high mountain valley …. these experiences are the essence of mountain biking in Nepal. We’ve pooled our collective experience from seventeen seasons of leading trips in Nepal and worked with our long established in-country agent to bring you the itineraries that are both the local mountain bike guide’s, and our own, firm favourites. Hugely varied riding terrain, adventure, scenery on a grand scale and the friendliest of welcomes all combine to make Nepal a must visit destination for any cyclist. Why book with Rather Be Cycling? 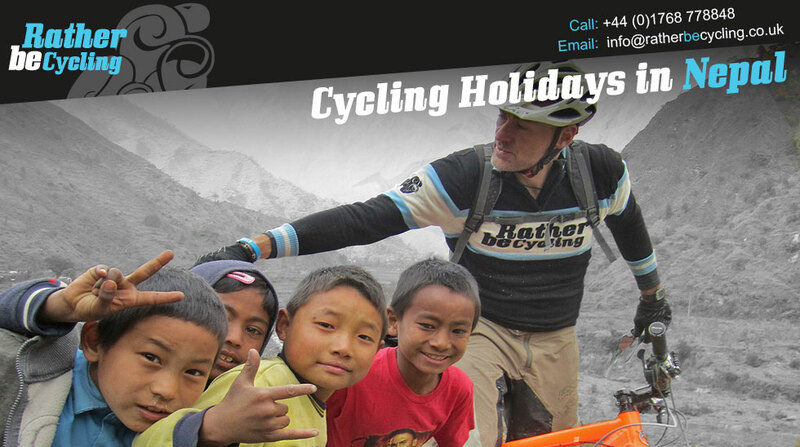 ALL of our Nepal biking trips include the services of both a UK qualified and experienced Rather Be Cycling mtb guide and a experienced local Nepali mtb guide regardless of the group size. This adds adds value, professionalism and expertise to your trip. Check the small print to see if a qualified guide is included with other operators trips – they often aren’t or are only added in on large group sizes. 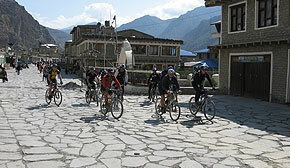 Our adventurous mountain biking holidays are organised by mountain bikers for mountain bikers.